On Tuesday, September 2, Sharon participated in a Financial Services Roundtable during the Republican National Convention as a representative of the President’s Advisory Council on Financial Literacy. This is one of several events Sharon is participating in on behalf of the advisory council while in Minneapolis. 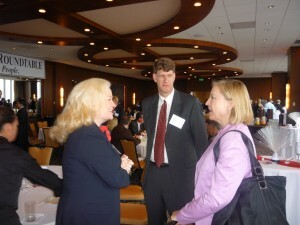 In the picture to the left, Sharon speaks with Kathy Wills Wright, Special Assistant to the President, Charles Schwab, and vice president of Legislative and Regulatory Affairs, Michael Townsend. The roundtable featured a presentation by fellow advisory councilman John Hope Bryant. The roundtable brought together some of the brightest minds in both the financial and government sectors dealing with the nation’s economy. The economy has been an increasing spotlight in the 2008 elections amidst a national credit crisis, a struggling mortgage industry and an overall economic slow-down. The work Sharon and others do on the council will help shape the information our next President will receive and act upon to ensure a future bolstered and expanding U.S. economy.